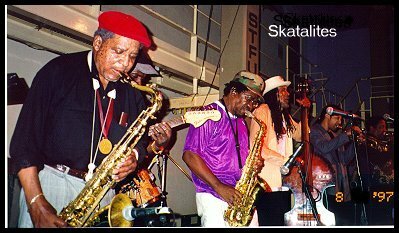 'The Skatalites were among the original pioneers of Ska the sound of independent Jamaica. From the Studio One sessions in Kingston the band found favour with the British Mod scene and crossed over to pop with the hit 'Guns Of Navarone', then presided over the shift from Ska to Rocksteady'. Line up of Musicians: Roland Alphonso - Tenor Sax, Lester Sterling - Alto Sax, Lloyd Brevett- Bass, Lloyd Knibb - Drums, Bill Smith - Piano, Devon James - Guitar, Nathan Breedlove - Trumpet, Will Clark - Trombone, Vocal - Doreen Schaffer. 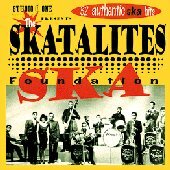 Play List: Skatalites Countdown from 10 to Freedom, Occupation, Man In The Street, James Bond, Never Let You Go-vocal Doreen, Can't You See-vocal Doreen, Simmer Down-vocal Doreen, Guns of Navarone, Phoenix City, Ball of Fire. Camden Street Market. Wednesday was a hot summer night in the city of London, the traffic was busy winding it's way home. The Jazz club almost lost in the hub hub, grey yet sophisticated front with clear bright windows welcomed us, with its ticket office next door. Attendants stood by the opened door, a small bill board on the footway it's hand written red letters displayed that the Skatalites were playing tonight. Mostly young people stood about in small groups chatting to pass the time, some leaned on the footway railings to stare at the traffic waiting at the lights. We open at 7.pm read the sign on the glass door," come on in "said the black man with a grin. " 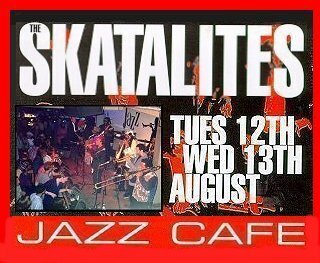 The Skatalites" come on at 9.00pm no re-admission, thats right, go right on in". Close to the door is a large bar and double sided counter with bottles and glasses, a chalk coloured sign displayed all the liqueur prices. The main area is fairly small and intimate, the stage was set. Musical instruments and sound equipment, drums and grand piano balanced the stage. Black silhouette of a trumpet player was sandwiched between high black letters spelling out the Jazz Cafe. Soft jazz background music was coming from the speakers. Three booths faced the stage, a small group of elderly people sat drinking with a reserved sign on the table. The other two booths were full. One empty small table with three seats right at the end of the stage, we sat down, two Becks (forget the price !). The dance floor was grey, red walls and, blue illuminated signs. On the left it looked like a sound mixer inside a stall. Down the small flight of stairs was the cloakroom with an attendant, who was reading the daily paper. Up on the first floor was a balcony restaurant with tables set out for dinner, patrons could relax have a meal and watch the musicians on stage, behind was a small illuminated cocktail bar. I noticed a black flat type case left upright at the end of the stage, just by our table, the label read Lloyd Brevett Brooklyn U.S.A. to London Gatwick. An atmosphere of anticipation was in the air Miss was busy writing these notes. The club began to fill with a mixture of different types of people, some young couples, groups of three or four, Japanese with cameras, skinheads and Rasterfairians. In came the Skatalites carrying their cases, you could not help noticing that a small man was limping, it was Roland Alphonso. Most went upstairs, Lloyd Brevett walked over to the stage passed us and said a greeting and commenced to change some strings on his electric base. The hum of talk was filling the room and Ska fans drinking (more Becks please !). The place was getting packed some now sat on the edge of the stage, it was gone nine. At last an ageing punk in a suit leapt onto the stage and began to introduce the Skatalites, I could see them walking round us to the stage. I acknowledged Roland Alphonso with a gentle tap on the shoulder, as he passed by. The trumpet player Nathan Breedlove counted down from ten to freedom until they were all in place and began to play (not sure of the tune, think that it was Skavoovee). The waiting audience immediately moved to the front of the stage, flashes went off. We soon moved from our table to take up a good position very near to the front of the stage. You could touch the excitement it was on everybody's face my camera was soon clicking way. Mostly young dancers had gathered at the front, they were off, could you believe it they were dancing the Ska ! Soon into the next song Nathan introduced as Occupation (Music is my Occupation) originally by Don Drummond and Tommy McCook). I was struck by the clear sound and the fact that it was not over amplified, and it was pure Ska played with such enthusiasm, it could have been 1965. The band were so laid back and looking into the audience for that feeling of rapport. All the tunes that were played were long versions around eight or ten minutes, this was of course long enough for the solos by the various artiste. 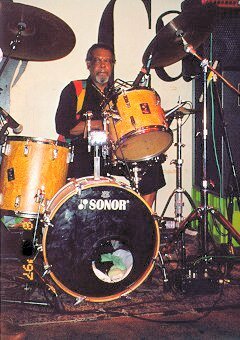 They jelled together in particular Lloyd Brevett on the base who was lost into the rhythm with Mr Knibb on the drums leading the beat. Were we in for a musical treat !. Even the trombone sounded brilliant on Man in the Street by Will Clark. Doreen was introduced as the original singer with the band in the early sixties, she soon proved that age was not a barrier for a Ska singer. The fast pace of Simmer Down kept the dancers happy. At this point I disappeared upstairs into the restaurant to take some pics only to be cautioned "no flash photography sir" too late I had already taken them. 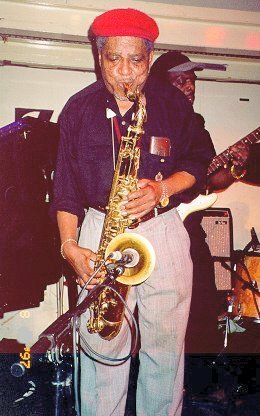 Roland Alphonso took his sax parts with ease and showed his appreciation of the tremendous applause by waving his hands and nodding his head. Lester Sterling looked so relaxed it was hard to believe the ease he played his solo parts. which could be felt and seen in the movements of the dancers. The Guns of Navarone was introduced and the teenagers began to go wild with feverish dancing, once again the trumpet player Nathan did the limited vocals. By the time they had moved into Phoenix City the place had gone wild, everybody was moving to the ska beat (including the young man down in the cloakroom) the instrumental breaks were outstanding including Bill Smith on piano and the sharp playing of Will Clark on trombone and Nathan on trumpet. Devon James on guitar who had kept the rhythm just at the right pace. All too soon it was the last number with what was a deafening cheer they came down to play an encore, this was introduced as Ball of Fire from their new CD which had just been released. Sounded just as good as the original which I had listened to many hundreds of times. The pace was fast, good trumpet and the sax from both Roland and Lester was great. Lester started to dance and move with his alto to cheers from the audience who by this time started to shake their hands before they finished and were gone. We followed them after a short time upstairs to see Lester Sterling sitting down with what appeared to be his family. I asked if he would confirm all the names of the band, this he did, to the background of jazz music now playing. Miss was busy with her notes, it was difficult to hear with all the noise. "What's happened to Tommy" I asked, "oh Tommy McCook", he has retired not playing any more". As I shook his hand and told him of my great pleasure at being at the gig, he said "my name is Lester Sterling", I replied "I know who you are I've been listening to you for over thirty years. Take care of yourself". Roland and the rest of the band had disappeared into a small room at the back, a sign on the door said 'Private' as the door closed on a great night. If you wish to use any of the photographs you must ask, E-mail me first.